This non-transferable, matte liquid lipstick is a must for dancers and cheerleaders! 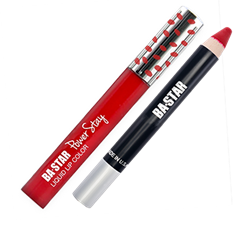 Perfect for multiple costume changes or if you want your red lipstick to stay on all day without running or staining. Red Lip Pencil defines lips and makes them pop! Power Stay Lip Paint and Holiday Red Lip Pencil! Pressing Lips Together Helps Transfer Color Evenly! Once It Dries, It's Smudge Proof! Check Out our Vimeo to Learn More Tips by Clicking Here!